Klassical Dream, A Plus Tard, Delta Work, City Island and Minella Indo are all worth watching. 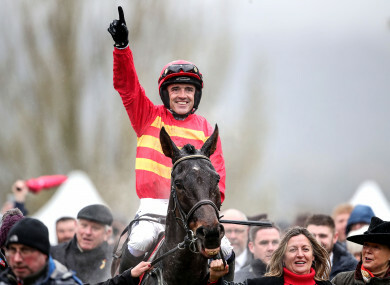 Ruby Walsh celebrates after Klassical Dream's victory in the Supreme Novices Hurdle. THERE WERE PLENTY horses to note from this year’s Cheltenham Festival. Here are five whose respective journeys over the course of the next 12 months could be worthy of close attention. Klassical Dream had the option of running in the Ballymore Hurdle on Wednesday, and it would have been some race between him and City Island if the pair of them had clashed. In the end, the Willie Mullins-trained gelding ran in the Supreme Novices’ Hurdle on Tuesday, and he danced in. Klassical Dream was keen before the start, but he settled nicely for Ruby Walsh through his race. Prominent from early, he moved to the front at the fourth last flight, and he was never headed. He came clear on the run to the final flight, and he stayed on strongly all the way to the line. Jean Coleman’s horse has myriad options now. Unbeaten in three runs since he joined Willie Mullins, he can go up in trip, but he obviously has the pace to stay at two miles. He can stay over hurdles, but he could also embark on a chasing career next season. He could be an Arkle horse for next year. He is only five and, whatever path he takes, there is no knowing how high he could go. A Plus Tard was seriously impressive in winning the Close Brothers Chase on Tuesday. Never too far off the pace, he quickly settled into a nice racing rhythm for Rachael Blackmore. He hit the front at the top of the home straight, and he came clear of his rivals over the final two fences to win by 16 lengths. This was the performance of an individual who can go beyond handicaps now. Henry de Bromhead’s horse handled the track and the occasion, and his jumping was efficient and accurate. He is only five and he was racing on Tuesday for just the fourth time in his life over fences, so he still has bags of scope for further progression. Next year’s Ryanair Chase would be a logical medium-term plan. Delta Work only finished third in the RSA Chase on Wednesday, but there may be very little between him and the two horses who finished in front of him. Gordon Elliott’s horse travelled and jumped well for Davy Russell, and he looked a likely winner as he moved into the lead at the third last fence, at which point he traded at odds-on in-running. He travelled well in front on the run around the home turn, but he got in tight to the second last fence, and he lost momentum. Suddenly, in the 15 or 16 strides that it takes to get from the second last fence to the last fence these days, he went from first place, travelling well, to third place and playing catch-up. He did run on well all the way to the line, but he had to switch as Topofthegame and Santini came together in front of him, and he just couldn’t get back at them. Topofthegame and Santini are both hugely talented young staying steeplechasers, but so is Delta Work. The Gigginstown House horse is only six, he is a year younger than his two fellow novices. He could still morph into a genuine Gold Cup contender for next year, and it appears that he has been under-rated in the ante post market. City Island was impressive in winning the Ballymore Novices’ Hurdle on Wednesday. He and Champ had it between them from the second last flight. Champ is obviously a highly talented horse, the Challow Hurdle winner and really highly regarded by connections, but City Island proved to be the stronger horse up the run-in under Mark Walsh. Martin Brassil’s horse has passed the post first in all four of his races over hurdles, and it will be interesting to see what route connections take next season with him. He is from the family of Morley Street and Granville Again, so it is not surprising that he is a talented hurdler. He jumps well, he stays well, he is still only six and, if he remained over hurdles, the Stayers’ Hurdle would be a legitimate target for 2020. It is often the case that, when a horse wins a Grade 1 race at a big price, the performance is generally under-rated, and that may be the case with Albert Bartlett Hurdle winner Minella Indo. He travelled really well through his race for Rachael Blackmore, and he moved to the front as they raced to the home turn. That is a long way out on the hurdles track on the New Course, but Henry de Bromhead’s horse was travelling so well that his rider was happy to allow him stride on, confident that he had enough in reserve to get home. He did too, he stayed on strongly to repel the challenge of Commander Of Fleet, and the pair of them finished nicely clear of the talented Allaho in third. The form is rock solid, and this was just Minella Indo’s third run over hurdles. There is every chance that he will progress again. He obviously stays really well, he is a chaser in waiting and he could be an RSA Chase horse or a National Hunt Chase horse for next season. Email “5 horses to follow over the next 12 months after the Cheltenham Festival”. Feedback on “5 horses to follow over the next 12 months after the Cheltenham Festival”.